Walls build using the traditional stretcher bond are just a half brick wide and as such are relatively unstable and generally if they are higher than about 40 cm (5 courses), piers are required to strengthen them. As with any wall built of brick, no two adjacent vertical joints should be in line. For piers at the ends of a wall, the first (and alternate) course should have two full bricks placed at right-angles to the run of the wall. 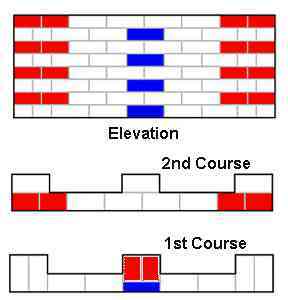 The second (and alternate) course should use two 3/4 bats (coloured red) in the face of the wall and a full brick behind. For piers in the run of the wall, the first (and alternate) course needs a 'Queen Closer' (coloured blue) in the face of the all with two 3/4 bats behind. The second (and alternate) course uses full bricks in the face and a full brick behind. The piers can be strengthened by embedding a piece of mat reinforcement into the mortar of alternate courses.